Doug is moaning that he can't afford a laundry service, Pam says they hardly have any money. Doug says she shouldn't make any plans to fix the problem as Cody and Adam also leave. Melissa is telling Todd about Josh taking the blame for her; she says she can't go out with someone who supports vivisection. Josh returns and a teacher approaches to tell them that they have more mice to dissect, Melissa looks upset. Ryan defends Kerry but Dorothy says she broke the law and that many students will benefit from the Biology class. She says she will have to answer to the School Board about it and therefore she has to go to the Police. 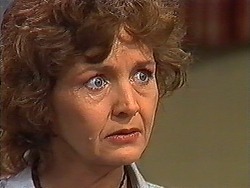 Clarrie announces that he is leaving, Ryan and Dorothy are a bit upset but Clarrie is determined. 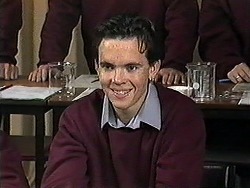 He goes to speak to Helen as Ryan blames Dorothy. 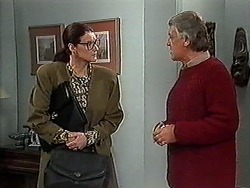 Clarrie tells Helen he's leaving, he gives her an expensive gift, it's a Black Opal. Clarrie says Helen has made everything OK. Helen loves the gift! The teacher (Mr Denning) describes the vivisection and says that anyone can leave if they so wish but first they should air their views. Melissa gets up to speak. PUPIL 1: They're already dead, Melissa. Melissa carries on and someone that fancies her speaks up, she asks who is with her? A couple of students agree and Melissa pleas with them. 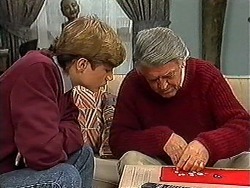 Adam arrives home, Pam is doing the books. 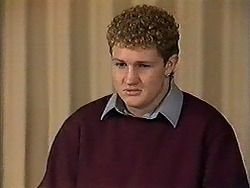 Adam says he is glad he is back home as it's quiet and he can study, Pam goes to see Helen. Helen is sorting her jewellery out, she suggests to Beverly that they go out but she doesn't want to, she is still in her dressing gown. Pam arrives and Beverly disappears. 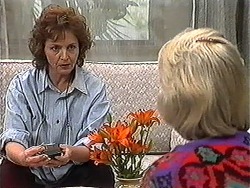 Pam is impressed with Helen's jewellery and especially with Clarrie's gift; Pam explains she is broke as Helen answers the phone. Melissa is annoyed that only two random pupils came out of class with her, Dorothy arrives to talk to Mr Denning about Josh. As class is dismissed Melissa runs off in tears as Josh comes over. Pam is vacuuming and interrupting Adam's study, he seems to be wearing Dennis Taylor's glasses! 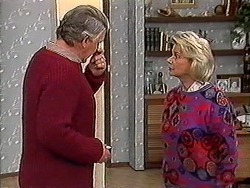 Pam promises to be quiet but carries on making noise as Doug arrives home with some dead but unplucked chickens. Adam becomes more annoyed as Pam and Doug make noise; Pam announces she has an answer to their money problems. 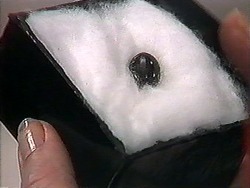 Clarrie is showing Ryan his other stones; he discovers that he gave Helen a very valuable one which he wanted to keep. He decides to go and ask for it back, Dorothy offers to do it. CLARRIE: No, this requires tact and diplomacy. He then thinks there might be a better way to get the stone back. Doug is plucking the chickens as Cody and Adam argue about the TV and where they sit. As Adam sits in the chair that Cody wanted to she decides to tip him out. Jim says he and Beverly should go out for dinner but she declines his offer. 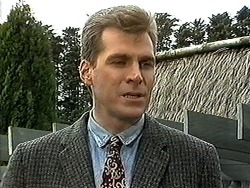 Jim notices Helen's jewellery and she goes to show him Clarrie's gift but it's not in the box, they speculate what could have happened to it and decide Pam stole it! Helen is unsure but Jim thinks it's perfectly obvious and Helen has to go over, Jim decides to go over. JIM: You can't let the Willis' get away with this! Melissa and Josh discuss the class; she wanted him to stand up for her. Just then two guys come in and give Melissa a hard time, Josh stands up to them, Eddie asks them to leave. Helen comes over and asks Pam about the jewel from earlier, Doug immediately gets defensive and thinks Helen is accusing Pam of stealing. 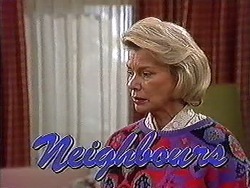 Pam defends Helen but she hesitates when she Pam asks if she thinks that Pam stole the jewel, Doug asks Helen to leave.